I've not seen slide out cameras for years, didn't know it was still a thing.... Not sure what punch hole cameras are (didn't read it all). I remember some old Nokia's, where you slid the front, to expose the camera or music controls, there was the N90/N97 (can't remember which) that had s camera mounted on the top of the phone which could be turned around and held like an old camcorder. For its day, it took quite a decent photo. I remember Nokia even having a camera with OPTICAL focus, that didn't last long. Samsung phones which still had a flip design n rubbish camera, with an Arial, while Nokia dropped the stubby. It's strange how now, Nokia's are rubbish, and Samsungs are brilliant (my opinion, the best overall). I think the note 9 is as good as it can be today for a phone to be. I like the idea of protecting the camera and lens, but I would rather a slide "door" or something as opposed to a pop out camera, that requires a ribbon cable which is just one more piece to break (not counting the mechanism, spring and "hollow" gap that could be utilized for anything, like heat sinking). Wish glass wasn't used for backs as well, but that's just me lol. If Samsung actually goes through with this, they could potentially resurrect the idea of modular phones. Resources are getting depleted with how many phones are produced a year so there has to be some form of sustainability. Whether it be making phones last long or swapping components as needed. Given that Samsung is known to innovate, I wouldn't be surprised if they, or a Chinese company, does it first. But that's just my optimism speaking. That idea wouldn't bring in enough profit for companies to care. You are talking about Project Ara, googles failed project. The problem with modular phones is that upgrades and interfacing was/is not very reliable for the systems back when they first looked into it. The best option is to probably take a page out of gaming systems and have longer times between models. Gives more time to proof concepts as well. When I think of modular, I can't help thinking of canon and their camera lenses. Many years ago, when film was king, and you had motorised cameras, you could hot swap lenses from one maker to a different make body, by using an adapter. Canon decided when updating their bodies, to change the lens mount. Meaning all their own old lenses and people who had favourite lenses from a different make, could no longer use the bodies. So even Canon purists had to buy new lenses. They refused to make an adapter for any lenses except their new lenses, with the new style mount. So everyone who had built up a collection of bits were screwed! My friend/tutor, had to either spend a fortune building a new kit, or buy the new Nikon body which didn't need an adapter, and even accepted his canon lenses (with adapter). So with that in mind, I don't like modular stuff, cos they only got to change a screw/mount whatever, and you're collection is worthless. Still not sure what a "punch hole" camera is. Not yet. It will be on the new phones and is called Infiniti O display. It's not ideal but I think it's better than a large notch. 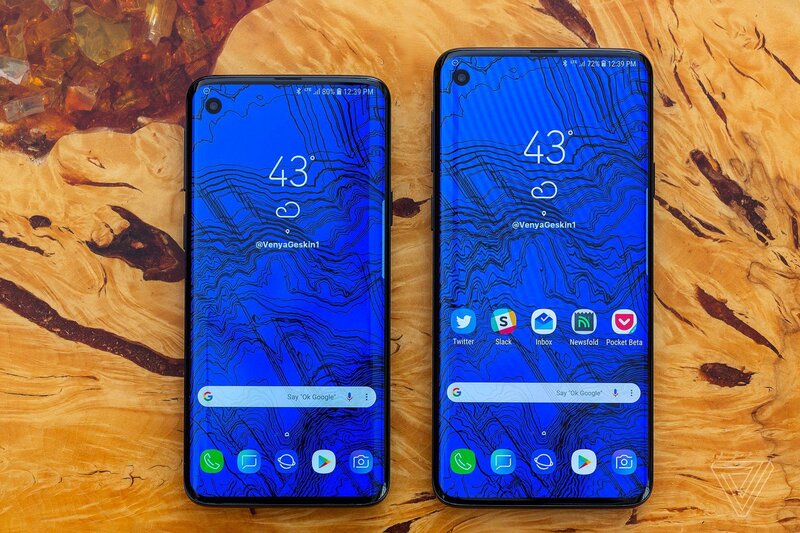 Yea i'm looking forward to the release of the S10, especially the S10+. That's gonna be a beast of a phone! I like my LG V35, i lose a little under 1/4" on top for a very nice 6.1" LED screen. Edge to edge is truly bothersome in a lot of instances. The hole punch camera doesn't bother me and I think it actually looks kind of cool. I have also seen some interesting animations that go around the hole punch cam. I'm glad more companies have stepped into the premium phone arena they seem to be pushing innovation. 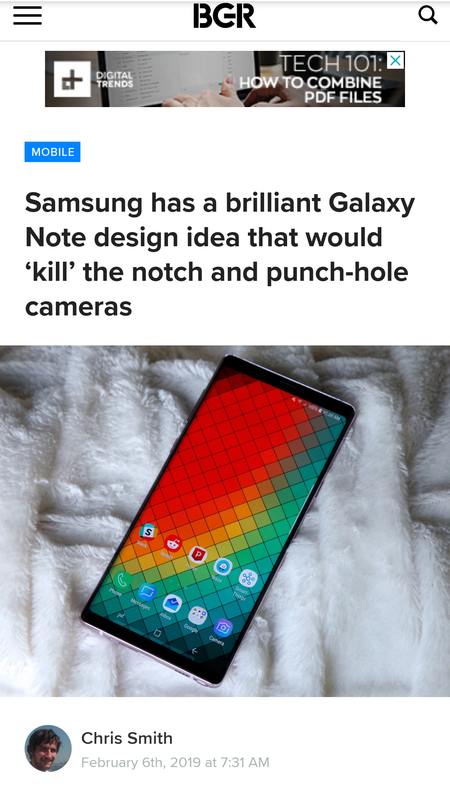 i dont really ming the notch or the whole punch as long as the phone works i dont care as much about something as small as that. @ikari04warrior I agree that adding extra movable parts can break and I personally prefer the notch or cut-out just like they are now. Not ready for that kind of change.